More of a scrambling shrub than a climbing plant Tecomaria capensis ‘Aurea’ is commonly known as the ‘Cape Honeysuckle’. It does require support and training to grown as a climber. Very attractive bright clear yellow flowers contrast well against evergreen, deep green, glossy foliage. Although this is seem as a tropical plant it will grow well in cooler climates as long as it has a warm sunny position protected from frosts and cold winds. This is a very versatile plant that will cope with seaside conditions, heat, full sun to part shade. It is reasonably drought tolerant once established. Regular pruning can see Tecomaria capensis ‘Aurea’ kept as a fairly neat shrub. Fertilize in spring with an all purpose slow release type fertiliser. Very easy from cuttings taken at just about any time of the year. 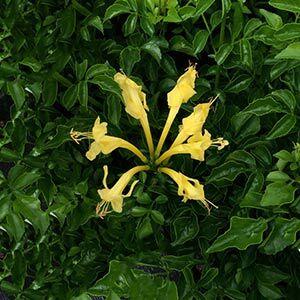 Versatile in that it can be used as a shrub if pruned, trained as a hedge, or left to spread as a sprawling ground cover, or given some support used a climber for covering fences or walls. Use it as an espalier, or train to grow over a pergola or garden arch. This is a fast growing plant, so for a quick screen or fence cover it will do the job. It can also be trained to grow over a trellis or pergola if desired. Height – To 5m, usually pruned lower. Position- Full sun to a little shade. Flowering will be less in shade. Soil – Well drained is essential. Humus rich for best results and growth. Moisture – Will appreciate some extra water during long dry summers. However it is regarded as drought tolerant. Foliage – Good deep green and glossy. Flowers – Clear yellow, tubular shaped held in upright clusters. Flowering period – Through the year in warmer climates.